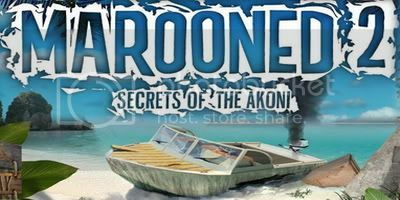 Descend deeper into the mystery surrounding a chain of beautiful, but perilous islands with Marooned 2 - Secrets of the Akoni, the long-awaited second installment of the acclaimed series. In Marooned, Macy Black awakens on a deserted island without memory of who she is and why she is there. Upon exploring the island, she discovers her presence is not by coincidence, but by a startling betrayal. Her only escape lies in solving the mysteries around an ancient people called the Akoni and a powerful crystal known simply as the Resource. Now, her escape is short-lived and the stakes are even higher as Macy comes face-to-face with her betrayer for the first time. But in a twist of fate, she must join her nemesis in a race against a greater foe and try seizing the remaining Resource to prevent a deadlier secret of the Akoni leaking out into the world and wreaking havoc. Can she walk this tight rope over a devious plot for greed and power, and make it out alive? •	The suspense builds in this eagerly anticipated Hidden Object sequel. •	Explore 27 all-new locations and ever-mysterious ruins. •	Meet foes old and new as you walk a tight rope over a perilous plot for greed and power. •	Unleash a new use for the Akoni Resource by way of engaging mini-games. •	Uncover a startling secret of the Akoni by solving demanding puzzles. 200 MB | Includes the 1st 'Marooned' Game!